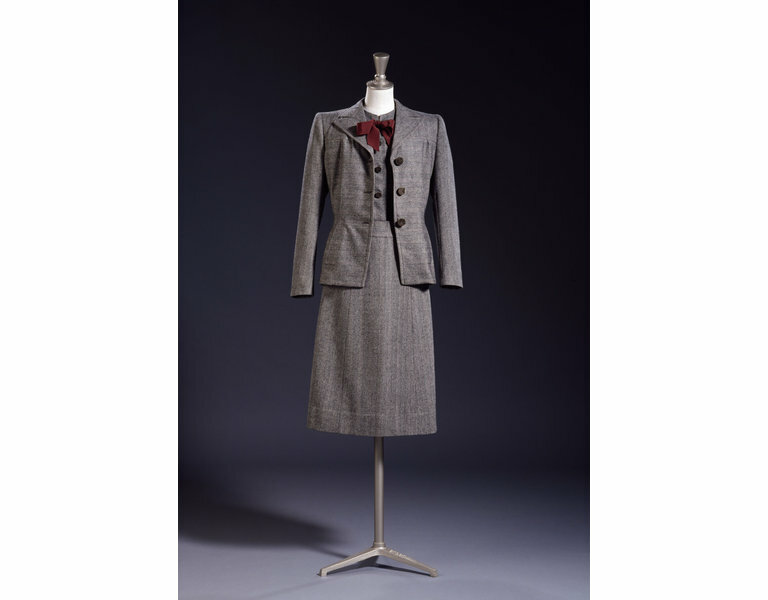 Grey herringbone wool jacket, skirt and blouse. The buttons featured on this tailored Utility ensemble, commissioned by the Board of Trade, bear a wartime message: CC41 (Civilian Clothing 1941). Label, blouse left side seam. Black on white. In 1942 the President of the Board of Trade gave the prototype Utility clothes, designed by designer members of the Incorporated Society of London Fashion Designers, to the V&A. 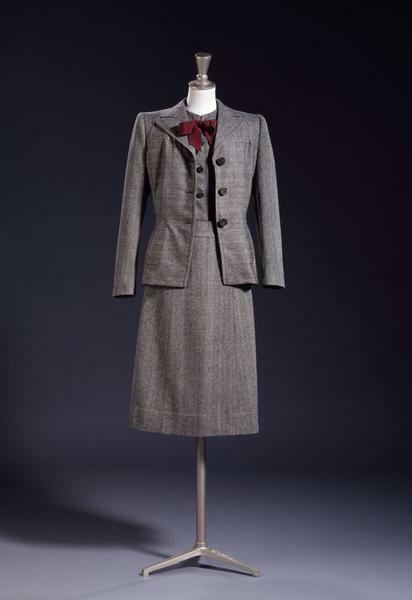 Although the designers of individual pieces were not publicised, this suit had Digby Morton's initials inked on a dress tag, which also identified it as 'Original no. 16'. de la Haye, Amy, ed. The Cutting Edge: 50 Years of British Fashion, 1947-1997. V&A Publications, London, 1997, pp. 38-40. Attribution note: Prototype Utility clothes were designed by designer members of the Incorporated Society of London Fashion Designers. The jacket has a cut that is stylish but pared down to conserve materials. Interest is created by utilising the herringbone stripes vertically and horizontally, the patriotic CC41 (Civilian Clothing 1941) metal buttons and the perky ribbon bow.